We always had a couple big box fans in my house when I was a kid. They were great for cooling off on hot days but I liked them for other reasons. Chopping up pencils was a main one. Strips of paper were better though… it wasn’t as loud so you were less likely to get in trouble. And I could never get tired of putting my face right up to the fan and talking like a robot. My dad, on the other hand, tired of this quickly. The knobs on the top of the fan never seemed to last very long. We usually needed a pair of pliers to change the speed on most of them. Anyone who’s been a kid and been near a box fan has to have done that. Anyone who didn’t do that needs to find a box fan, or even a smaller rotary fan and talk through it, just to get that experience. Anyone who doesn’t go do that needs to stick his tongue in the spinning fan blades. Cuz then the can amuse everyone else….for not amusing themselves…. When I was little i used to turn the lawnmower on and throw pvc pipe into the blades. …pvc pipes and a lawnmower…now THAT’S enertainment! I had old box fans too. I think I did the robot voice, but our fan’s blade was plastic, so the pencil thing never happened. I did tie balloons to the front though. I also turned it on it’s side and levitated napkins. I haven’t seen one in years though. We have a couple of box fans. They helped up when we lived in an apartment WITHOUT air conditioning. haha i loved talking into fans, and still do, even though society is screaming at me GROW UP, i still cant help but do what pleases me. i used to play golf in my block of flats, and hit the darn ball with a 5 iron until the ball came whooshing at myself. i stopped when i hit a car with it. I think what was meant here was that it’s best not to get ‘involved’ with a ‘fan.’ Or, maybe, to acknowledge them at all… whatever, I’ve always prefered the broad-bladed oscillators. They’s got a gentler touch. 10 reference points at stake here! Love the old comics… This really allows you to see how his style improved. I remember that when I was a kid, I tried sticking a whole bunch of crap in my parents fan. One day, I stuck a pencil in, not knowing that the plastic blades had a crack in one of them. Next thing I know, a chunk of one of the blade broke off, whipped out, and imbedded itself in the ceiling. reference is from tommy boy. Give me my ten points. Lumanaru, just be happy the plastic blade didn’t embed itself in you. I love those fans, for the way they affect your voice. How for to grow up? 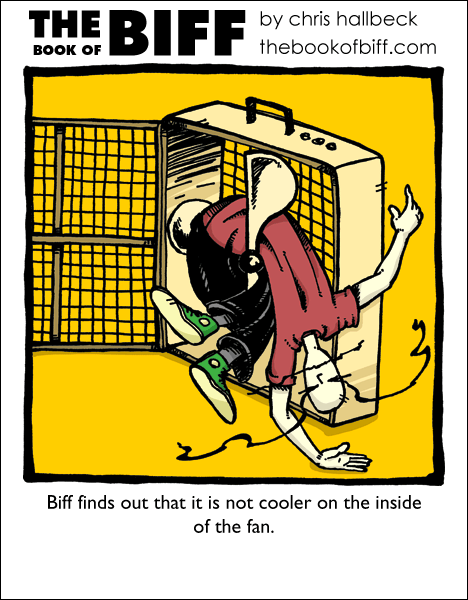 Now that Biff is rich and famous, maybe he’ll also find out it’s not cooler inside a fan?